of the french NDT Society (COFREND), SEP 22-26 '97, Nantes. 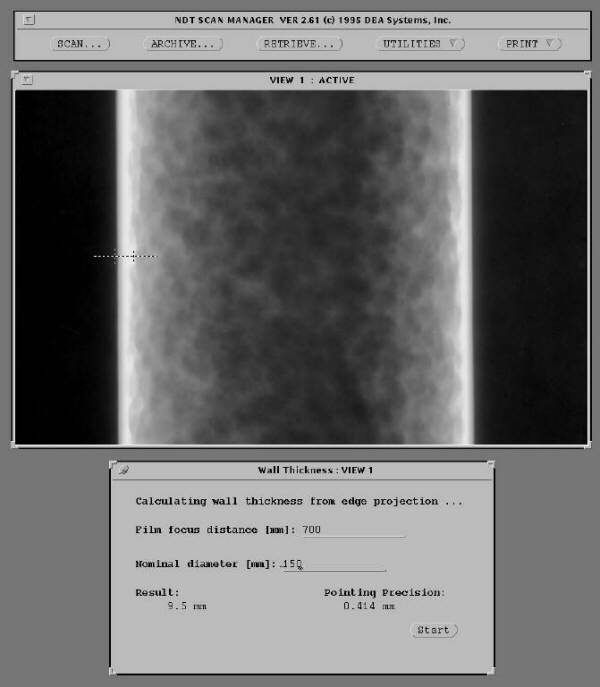 A software for interactive estimation of wall-thicknesses from digitised X-ray films is presented and its possible field of application is discussed. Both wall-thickness estimation from film density variation and edge projections are shown. A brief comparison to imaging plates is given. Des logiciels pour déterminer l'épaisseur des tubes d'acier des images des rayons X obtenues par plaques d'impression ou films sont présentés. Deux méthodes sont implémentées: la mesure de la intensité et la de la projection. Les possibilités des logiciels sont discutées et une comparison entre film et plaque d'impression est ajoutée. Projection radiography has long been used to determine the wall thickness of tubes. Wall thickness measurement by the use of film density variations has also been applied occasionally, especially for images taken with radioactive isotopes, because here the influence of scattered radiation could be neglected. These procedures have so far been done by hand, the operator first measuring either the shadow projections of the wall, or the film´s optical density, and then calculating the wall thickness by the means of a hand held calculator. The procedures of measurement and calculation can be automized with a computer system when digital images are at hand. This paper presents a software system that is capable of performing the measurement and the following calculation automatically for the chosen point provided that a set of calibration parameters has been entered by the user. 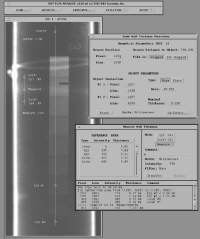 Since optical densities of radiographs can be correlated with the known nominal wall thicknesses the optical density at a certain point can be measured and the corresponding wall thickness be calculated after proper calibration. 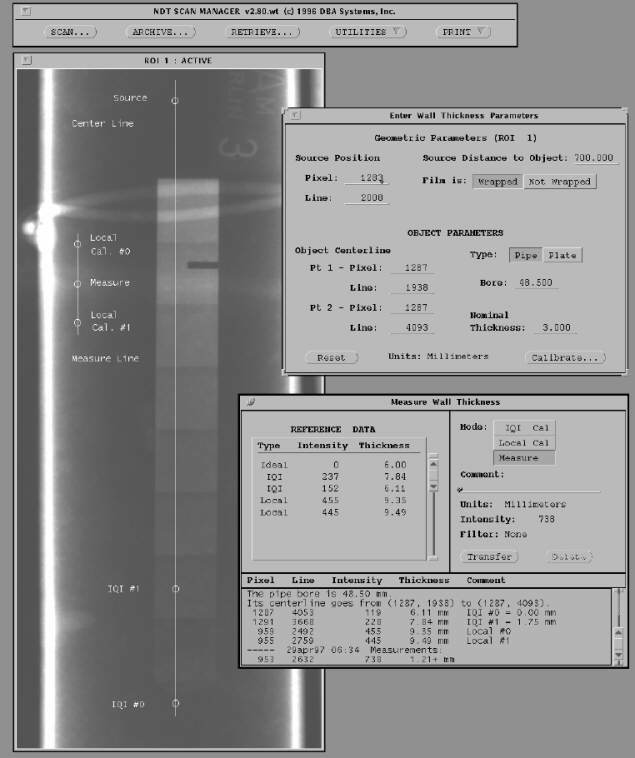 To automize this procedure a software has been included in the "NDT-ScanManager" (DBA Systems Inc., Melbourne, FL, USA) and tested for sources of different energy, including isotopes (Iridium and Cobalt). To determine the wall thickness by the density variations of the digitised film, a calibration has to be performed. First, the user has to provide several parameters like film focus distance, nominal thickness of the object, whether it is a pipe or plate etc. Then the actual calibration has to be performed. Two calibration points have to be entered, one representing the nominal thickness and one for a fixed wall thickness change (f.i. given by a penetrameter shim according to ASTM). In case the measurement is made for a pipe these points must be placed on the pipe's center line, and at least two further local calibration points near the actual measurement point have to be taken into account to compensate for the wall thickness change due to the geometrical structure of the pipe. The estimated wall thickness for the selected measure point is then given as a difference in mm to the nominal thickness. An example for this procedure, applied to a pipe is shown in fig.1. with the optical densities for nominal thickness and eroded wall, the attenuation coefficient and the wall thickness difference. where sglobal is the nominal thickness and slocal is the thickness at the local calibration point. The performance of the software was tested using digitsed films with step wedges of different thickness and different source energies. A second possibility to determine wall thicknesses for pipes is the measurement of the shadow projections of the wall. Those rays that are tangential to the wall edges also cause edge indications in the resulting image, i.e. discontinuities in the first derivative of the intensity functions. These have to be found and the distance between them compensated for the influence of the pipe´s geometry (see fig. 5). The aforementioned software also allows to make this type of measurement. The user has first to enter the parameters specifying the setup of the imaging procedure, such as film focus distance and the like (see above), then draws a line with the mouse orthogonal to the interesting part of the wall projection. The discontinuities of the first derivative will automatically be determined by means of an edge detecting filter and the geometrical correction be computed taking into account the given setup. The result of the calculation is then displayed in mm. This procedure is still experimental, an example for it is displayed in fig. 4. Note, that the procedure determines edges in the intensity function. This is not always apparent to the operator so that at a first glance the indicated edges seem to be at the wrong position. By changing the lookup table the user can evalute the accuracy with which the edges were determined by the program. The rapidly developing imaging plates promise some advantages over the use of radiographic film in the field of wall thickness measurement by density variation. Their linearity and greater dynamic range would allow a greater range of thicknesses to be measured. They provide other advantages as well, such as reusability, high sensitivity, and no need for a chemical darkroom. Their main disadvantages are still still higher costs and a higher sensitivity to scattered radiation. The Paper was presented on the UTonline Oct '97 issue - Focus on Thickness Gauging.